I make quilts in Urbana, Ohio, USA. I’ve been quilting on and off since about 1976, but have only devoted a lot of time to it in the last few years since I retired. My degree is in Fine Arts. I taught elementary art for 12 years, then 4th-6th grade for 18 years. Now I’m retired with time to explore this obsession we call quilting. I am really enjoying getting into color and design, and improving my skills. I also enjoy this big, great quilt community. You can find me on Twitter, Facebook, and see my quilts on Flickr and in my Etsy shop. I spend the rest of time reading, gardening, and traveling. I am married, my husband recently retired, too, which cuts into my quilting time. Our son lives with Asperger’s Syndrome, but is doing well and attending college. 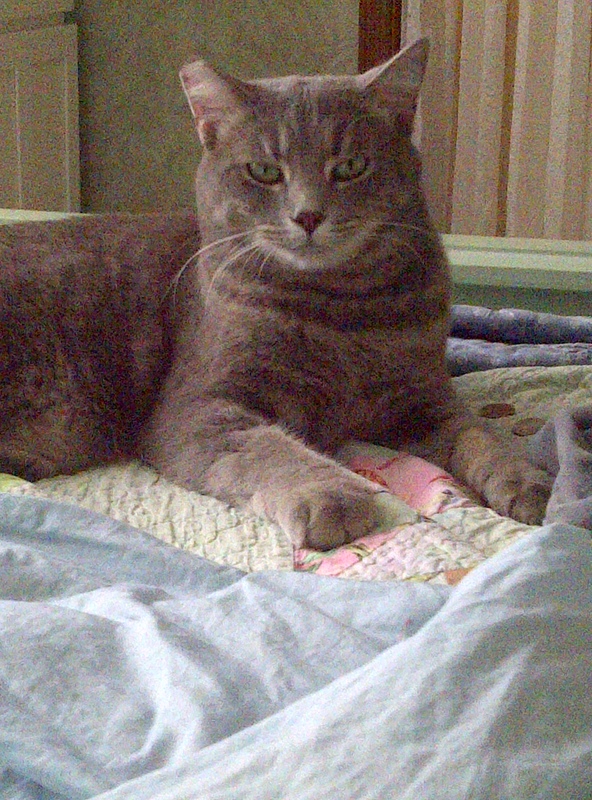 Yuri G. is our youngest, and the most apt to show up in quilt pictures. He is a rescue from behind an abandoned building. Rough and tumble, no neck, a very blue-collar cat, but devoted to me. A great hunter. Krissi came from the Humane Society. She’s lithe and elegant, and runs like a greyhound. 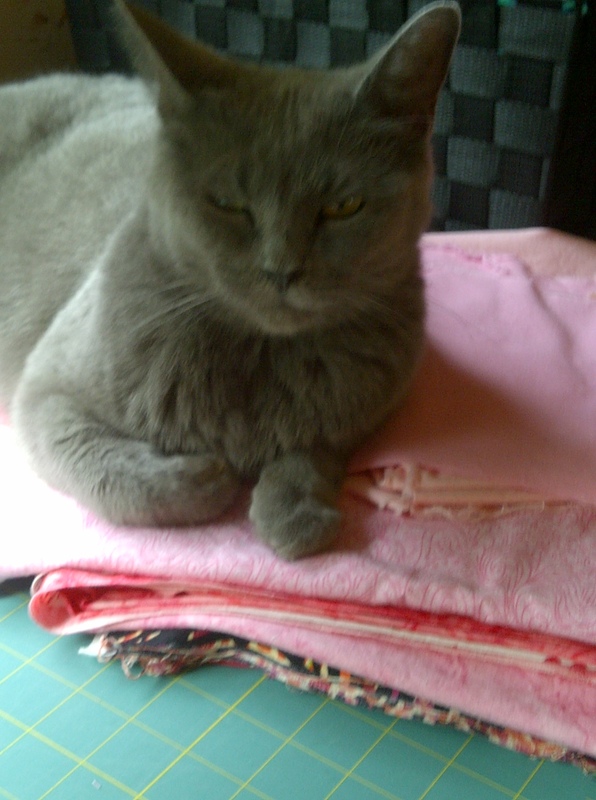 She’s happy to spend most of her time inside, and a fair amount of it in the quilt studio. I’m the media person for the Beaver Valley Piecemakers Autumn Quilt Show. Could you please post our quilt show on your blog. Approximately 100 quilts judged by a National Quilt Association Judge. The theme this year is 2 color quilts. Also, quilt and sewing machine raffles, vendors, café with homemade food, and a boutique. Admission is $7 and children 12 and under free. Hi Valerie; I dropped by to say that I have nominated you for a blogger award (One Lovely Blog Award); you can see my related post at http://1000needles.com/2015/10/27/one-lovely-blog-award/. I enjoy reading about your blog and connecting on Twitter. I’m so happy to have found you in the online quilting community.